Ford has finally put a price tag on its plug-in hybrid, $33,735. However, given the car’s onboard lithium battery capacity of 7.5 kWh, it also qualifies for $3,740 worth of government credits, enabling Ford to promote the car at an adjusted $29,995. In California, the vehicle is expected to be AT-PZEV-compliant which means it will qualify for the high-occupancy vehicle lanes. Additionally, the C-MAX Energi also is expected to qualify for additional tax credits up to $1,500 in California, bringing the cost even lower to some buyers. The Ford C-MAX Energi plug-in hybrid is expected to deliver 550 miles of total range, of which, “more than 20 miles” of driving can be achieved in electric-only mode – that is more than triple the electric-only range of the Toyota Prius plug-in hybrid (based on U.S. Environmental Protection Agency (EPA) testing methods). Ford’s representative, John Wood, told InsideEVs that the top speed will not be limited to 62 miles per hour in electric only drive mode, as found in the plug-in Prius, but declined to offer exactly what the C-Max Energi would top out at. Update: Astute reader bitguru notes in the comments that Ford has also put up a specificate sheet now on the C-Max hybrid and says it has a “Projected Electric Mode Top Speed” of 85 mph. One surprising aspect of today’s announcement is when the vehicle will go on sale. With the standard C-Max hybrid hitting Ford dealerships in September, the plug-in Energi version was not expected until early not year, but Ford has announced it will also be available starting this fall. As a comparison to the C-Max Energi’s obvious competition at Toyota, the plug-in Prius has a lower starting MSRP of $32,760, but only qualifies for $2,500 in federal tax credits, bringing its bottom line price $265 higher than that of the Ford at $30,260. Ford’s C-Max Energi website went live today, and you can configure your own C-Max Energi here. Full spec sheet of the C-Max Hybrid can be found here. 15 Comments on "Ford C-Max Energi Plug-In Priced At $29,995 After Credit"
Love it – great to see it right at the “beat Prius” price range. If it’s made in the USA, even better. (do we know what Ford plant it will come out of?) This could outsell the Volt next year given the distance Ford is from the political punchbaggery that was thrust upon the Volt. You can back figure the battery size at 7kWh just by the size of the Fed tax rebate. That size (and it’s 20 miles) is kinda small, but looking a little closer helps you to understand why. The C-Max Energi comes in at 4960lbs. Fisker got raked over the coals for being over 5000 lbs and their car is much larger. If C-Max came in that heavy they’d get lambasted. Plus Ford wanted the price to be competetive to Prius PHEV so they had to skimp on battery size to keep the costs low. I can’t say I’m impressed with the range, but they were smart about their implementation. The curb weight is wrong on the Ford website (go figure). They are inflated by about 1,000 lbs – curb weight of the hybrid is around 3600 lbs and the energi is around 3900 lbs. Still not light, though – each of them can stand to lose 400-500 lbs. Other than the hefty weight – the rest of the specs look to be extremely competitive if not best in class. Its a good choice for families that need more room than what a Volt offers, with recharging at your destination you can match the range of a Volt. Not a bad choice. FYI, Ford’s web site at http://www.ford.com/cars/cmax/specifications/engine/ says that the projected electric-mode top speed of the C-MAX Energi is 85 mph. Can anyone comment how the C-MAX compares (in physical size) with the PriusV? 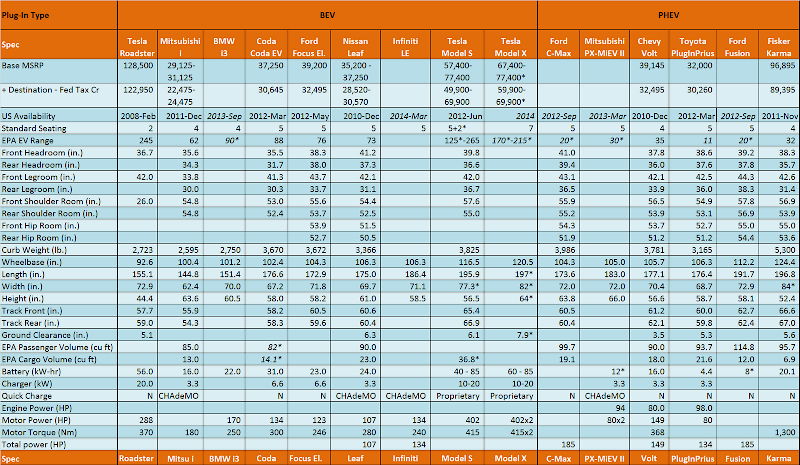 I’ve a comparison table at MNL (and other forums). Anyway, here is the direct link to the image. At $29995, it is still quite a bit of money for a vehicle of this size, but it is getting more and more competitive every day. Nice job Ford. I think the C-Max is nice, and will satisfy a lot of people, but I would be much more into a Ford Escape Energi instead. Hope something like that is in the works. I have just recently purchased the Prius plug-in (and am quite pleased with it). This article states that “… ‘more than 20 miles’ of driving can be achieved in electric-only mode – that is more than triple the electric-only range of the Toyota Prius plug-in hybrid …” The plug-in Prius goes 11 miles in electric-only mode. I don’t understand how you can say that that range of the C-MAX Energi is triple the Prius’. The Prius plug-in can only drive 6 miles on the EPA test before the engine has to come on to assist. This is why Ford can claim that the Energi can go more than 3 times further on electricity-only. Looking attractive from a number of angles, good start Ford, now how about a more active launch and ramp up! Whoever designed the front end gets an F for aesthetics. Hi! I am an institution college student conducting research regarding green energy with regards to house-hold electricity use. Please help if you take a 5 minute survey: http://bit.ly/10xvSJw This could feel very helpful to bring interest to the significance of green energy in American households. Say thanks a ton!